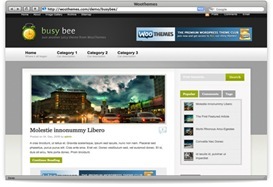 Today Premium WordPress Theme club WooThemes has launched another theme for its club members. It’s a Busy Bee. It can be used as a news based or magazine based theme. Alternatively you can use it for your personal blog, or your business website. and lots more. So, just have a look. © 2008 Espreson a Digital Magazine All Rights Reserved.